At the end of February, my newest Jane Lawless mystery will be published by St. Martin's/Minotaur. A Whisper of Bones is already receiving some wonderful reviews. Which reminds me: Because review sites are dwindling for every writer, may I ask that, if you have the time and the inclination, please consider writing a short review for Amazon, Goodreads, or other internet sites. If you like the series, it will help to keep it going strong. If you hate the book, drop Cordelia Thorn a note. I'm sure she'd love to hear from you. Speaking of new books, St. Martin's has generously offered me another two-book contract. I'll begin work on the next in the series this week. I always miss Jane and company when I'm away from them, so I'm looking forward to digging in. This past fall, I signed a contract with Recorded Books for audiobook editions of my last five mysteries. 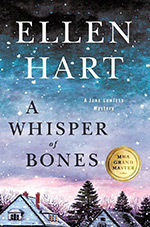 In fact, the new audio edition of A Whisper of Bones will be released on February 27th, the same day the physical book hits stores. I've grown to love audiobooks since I first joined Audible six years ago. If you haven't tried them out yet, perhaps a new Jane Lawless will pique your interest! That's all for now. Join me on Facebook for more frequent news and personal comments. In the meantime, I wish you all health, happiness, and great reading in 2018. Edgar Award winners; the award! © Ellen Hart. Web site by interbridge.